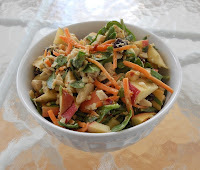 It was a healthy and I think far tastier twist on the popular mayonnaise-based apple-carrot-raisin salad. Plus, no guilt and good fuel! Last week my fellow One-on-One Endurance mom-triathletes, Tanya and Jennifer, shared some thoughts on fueling, managing appetite, and race weight. We all need a simple approach that works with the crazy logistics of our lives. The approach I use is to keep a stash of basic foods around that I can mix-and match to try to meet my energy needs throughout the day. These include proteins (chicken, ground turkey, some lean grass-fed ground beef, tuna, cottage cheese, greek yogurt), fats (flax, nut butters, hummus), veggies (fresh, roasted, or frozen), fruits, and grains (Ezekiel bread, Flatout bread, quinoa, brown rice, amaranth, buckwheat). Veggies, protein, and fat are the things that keep me satiated so I keep that in mind when planning my meals. (I seriously plan everything, if it's not on a list, a calendar, or a plan, I just can't do it.) 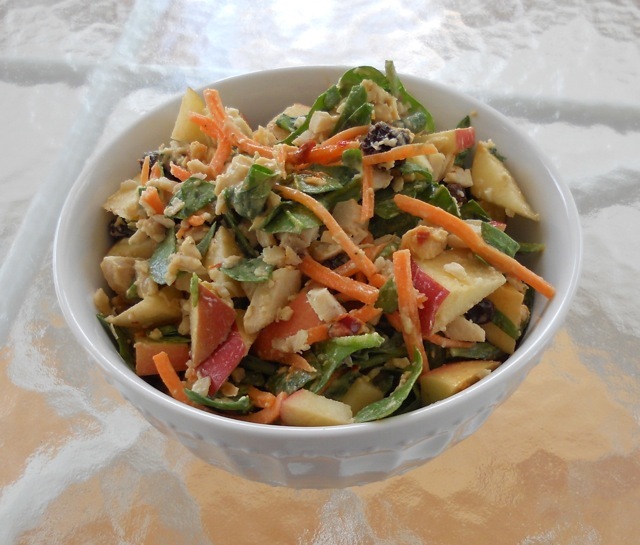 I have a lot of basic combos I rely on, but every once in a while I hit on a new one that is a keeper, like today's yummy salad. On the other side of the equation, I have a one Diet Coke a day habit, I use stevia, I eat pizza, I indulge in the occasional glass of wine or beer, I go out to dinner (and sometimes order dessert), I "tax" the candy from the kids' holiday hauls, I snack here and there, etc. Not perfect, but pretty good! My new mantra for the kids is that eating should take some effort, not alot necessarily, but some at least. Nearly anything you can grab-and-eat (and that has a wrapper) is suspect. Final confession: if the world really was going to end today, I'd probably eat my entire jar of homemade honey-roasted peanut butter (my major weakness). But since I'm pretty sure the sun will come up tomorrow and I'll be hitting the bike, that's probably not a good gamble.